Hard at work at Collab/Space NYC 2015. Photo by Lizette Terry. MediaShift’s second annual Collab/Space New York workshop took place last Wednesday, July 15, 2015. The main aim was boosting intrapreneurial innovation at media and tech companies — in other words, how established media and tech companies can improve innovation from within. 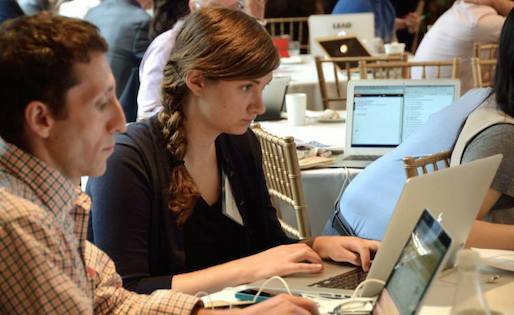 The workshop took place at the Ford Foundation in New York and was sponsored by the Donald W. Reynolds Journalism Institute at the University of Missouri. Eight presenters working on innovative projects from organizations like the Atlantic, BBC, Climate Desk, AP and more got the conversation going. Attendees later collaborated in breakout groups to brainstorm solutions. We’ve rounded up photos, coverage, feedback and a Storify to highlight some of the ideas that emerged from Collab/Space. Did we miss anything? Let us know, and we’ll update the post. Sonia Paul is a freelance journalist based in India and is the editorial assistant at PBS MediaShift. She is on Twitter @sonipaul.